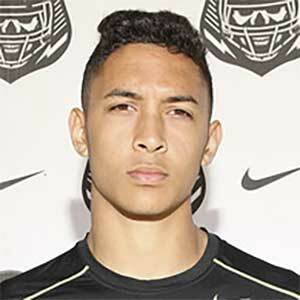 Talanoa Hufanga is a 6’1” 190 pound dual threat Quarterback and Strong Safety who received a scholarship offer to play for the BYU football team (Class of 2018) on March 11, 2016. Hufanga preps at Crescent Valley High School, where he has started since his freshman season, logging time as quarterback, safety, and linebacker. He also plays on the basketball team and competes in track and field (100m, 200m, High Jump, and Long Jump). Hufanga has not yet been rated by Rivals, Scout, or ESPN, but that hasn’t slowed down his recruiting. Hufanga holds scholarship offers from BYU, Oregon State, Utah, and Washington State. He is also being recruited by Arizona, Arizona State, Boise State, Cal, Colorado, Nebraska, Oregon, SDSU, UCLA, USC, and Washington. His brother TJ is a linebacker for Oregon State and with that being his hometown team has to be considered a favorite at this point in his recruitment.